I’m delighted to be able to support the wonderful education, learning and development of Spirit, spiritual awareness and mediumship through some wonderful evenings – Celebrating Spirit. These evenings will take place on the second Friday of every month starting in February 2019, from 6.15pm to 9.30pm, and will run with the below format. 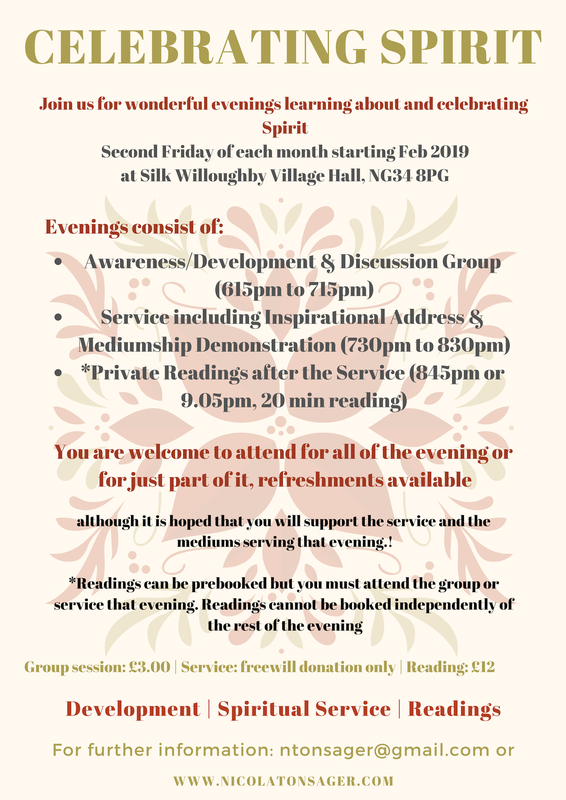 It is very much hoped that these evenings will work to support a developing interest in Spirit and spiritualism and that they will appeal to those of you that wish to learn more or develop but are reluctant to attend a spiritualist church, for whatever reason. It is also my aim to be able to offer a platform (pardon the pun!) for developing mediums that are at the stage where they are ready to demonstrate and develop further their inspirational speaking and mediumship demonstrations through public work. I do hope that you will be able to join us for these lovely evenings, to support Spirit, our new generation of mediums and yourself through a Celebration of Spirit – remembering of course that you are also intrinsically spirit! Refreshments will be available after the group session just prior to the service and again, after the service.